Simple, classic, yet beautiful. 12 red long stemmed red roses are presented in a clear vase with babies breath and fern. Our Freedom roses have a full, passionate red color and are long lasting. We guarantee our roses to last at least a week. Simple, classic, yet beautiful. 18 red long stemmed red roses are presented in a clear vase with babies breath and fern. Our Freedom roses have a full, passionate red color and are long lasting. We guarantee our roses to last at least a week. Simple, classic, yet beautiful. 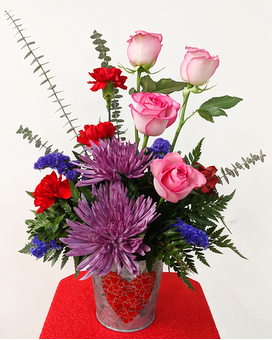 24 red long stemmed red roses are presented in a clear vase with babies breath and fern. Our Freedom roses have a full, passionate red color and are long lasting. We guarantee our roses to last at least a week.